It’s possibly taken you the entire month of June, but by July 4th, you’re starting to find your summer groove. 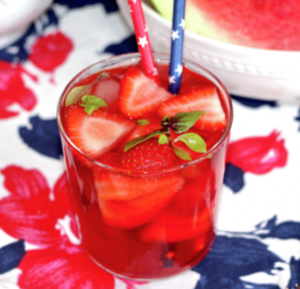 And summer vibes call for a fabulous Fourth of July party! At The Mad Table, we’re delivering the tips and tricks to make it a perfect holiday. Music: Think about your guest list when putting together your playlist. Old school jams and classic rock are always great, but if you’re entertaining a mixed crowd, include some different genres – from contemporary to Latin music – that will appeal to different age groups and musical tastes. Decorations: Let the traditional red, white and blue palette guide your décor. 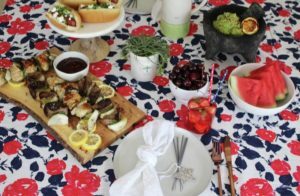 Start with a great tablecloth – either a red/white/blue pattern or solid color – and add contrasting napkins, perhaps in a light blue color. White plates are a tried-and-true classic and food always looks beautiful on them. Flowers and streamers in different shades of reds and blues are perfect and you can throw in a few yellows and greens to provide a break in the color theme. Remember that everything doesn’t have to be matchy-matchy. Light blue and white striped straws can add some pop. 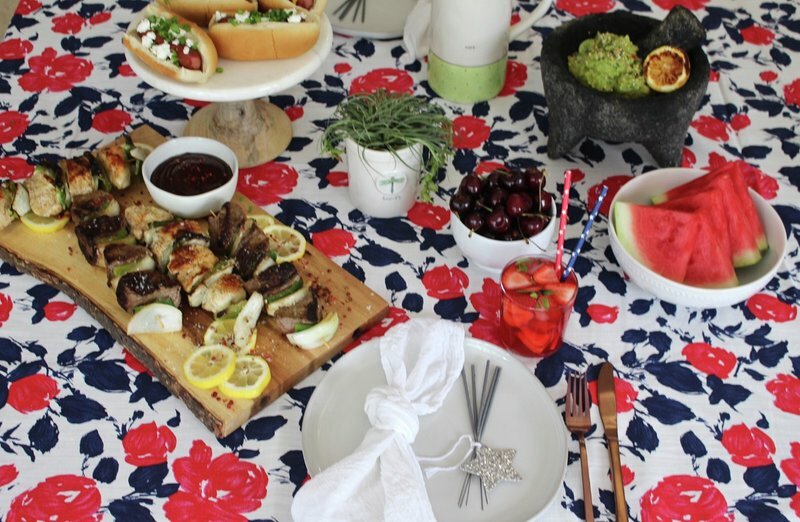 Speaking of pop, don’t forget to top those plates with sparklers. They make great party favors. Snacks: Keep the appetizers fresh and light. Make homemade salsa and guacamole and bake your own chips from bagels or pita bread. Melon, mint and prosciutto skewers bring the taste of summer. If you’re not sure how to meet the different tastes of your guests, try stuffed mushrooms with various fillings. And fresh fruit and veggie platters (with accompanying dips) are always a hit with both kids and adults. Cocktails: In keeping with the party décor, serve up strawberry smash cocktails (vodka, muddled strawberries and basil, club soda and a lemon slice). They look and taste delicious! Poolside: When it’s time to hit the pool or water, balance safety with fun. Buy extra goggles and stock up on squirt toys, cute/fun floats (swans, flamingos, donuts, etc.) and noodle toys. A volleyball and net are great for team fun. Be ready for your revelers with stacks of colorful beach towels. Food: Focus on meals that won’t have you spending hours in the kitchen or chained to the grill. Bacon stuffed burgers are hearty and don’t require a lot of prep. Other quick and filling options include bacon-wrapped chicken and pineapple skewers, potato salad, apple slaw, grilled veggies with herb vinaigrette, and lots of light, fresh, colorful salad options. Dessert: A red, white and blue trifle is a cold treat that will help beat the summer heat. Use summer fresh blueberries, strawberries, vanilla pudding mix, angel food cake and whipped cream. It’s delicious and oh-so-festive! Happiest Fourth of July to you and yours. Enjoy and stay safe!